On October 29-31 some of the main actors of the Rhino development, distribution, and training scenes gathered together in Castelldefels, Barcelona, (Spain) to learn and share their last experiences with Rhino. 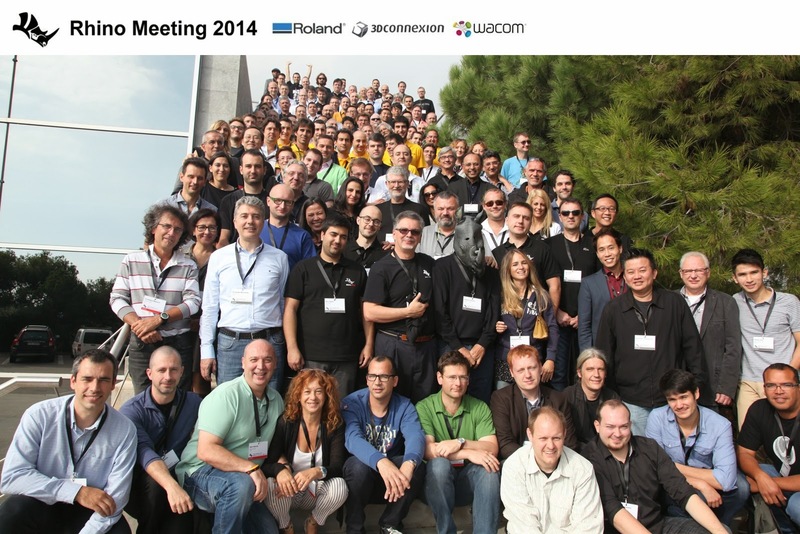 The event, sponsored by 3Dconnexion, Roland and Wacom, consisted of a series of conferences and networking sessions that brought inspiration and knowledge to an audience of over 200 participants coming from 35 different countries. Some of the topics covered during the conferences included the last developments at McNeel (Rhino 5 for Mac, Grasshopper, food4Rhino, Kangaroo, Developer Tools, Training and Support, RhinoFabStudio), as well as sessions that were an open discussion to comment on the latest technologies in the fields of Design, AEC (Architecture, Engineering and Construction), and Digital Fabrication. Partners that have developed a hardware or software product that adds substantial functionality to Rhino also had a side room to show their products. Exhibitors were Asuni CAD, Calgary Scientific, Chaos Group, CIMsystem, CL3VER, DATAKIT, Evolute GmbH, HAL Robot Programming & Control, MachineWorks Ltd, madCAM AB, MecSoft Corporation, Next Limit, Random Control, RhinoPiping, RhinoTerrain, Robots.IO, TDM Solutions, and Virtual Build Technologies. Everyone was excited to learn more about the size and diversity of the Rhino community—trading many stories about users, projects, and applications from around the world.